Pwede Padala’s tag line is give, save, and invest; these are the tasks that an OFW should do in no particular emphasize to a task. ALL are doable and each is equally important. But I want to emphasize that we should allot an amount in proportion to the income (passive or active) and goals. I’m an OFW in Canada, so you’ll see topics about Canadian investing which is also one of the reasons why started this blog. For the most part, I’ll also share personal finance tips relevant to the Philippines. 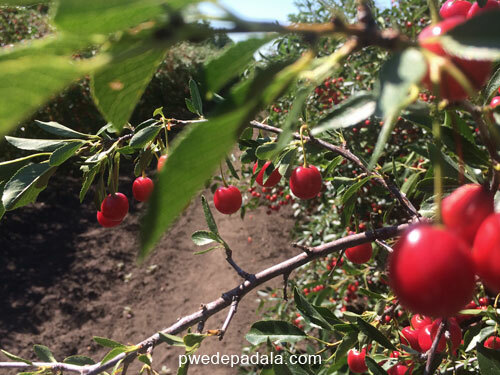 Experience cherry picking during summer in Canada. I plan to retire in the Philippines while having dual citizenship (Filipino-Canadian) as a digital nomad. Working wherever and whenever is like a dream but others have done it. Right? Blogging or writing is a form of meditation for me. I’ll write as long as I have hands, brain, heart, and ideas to share. Finance is something I like to always talk about online (don’t have much success in person) so being a pinoy blogger to help my kababayan is a goal already achieved through this blog and others that I can’t reveal. We may not have the same goal (OK, how about owning an organic farm) but I’m sure we have one thing in common: FREEDOM. So to help you start on achieving freedom with personal finance, I prepared a list for you. These are the top important tasks for OFWs. I don’t want to overwhelm you because the goal is to START somewhere, however. No excuses. Register in Pag-IBIG, SSS, and Philhealth. Know thyself. Nosce te ipsum. What are your short- and long-term goals? I told you it isn’t that much. The last part is the most tedious and requires constant rechecking. Personal finance habits can affect the environment and people around us. That while we are working on financial independence through business or as part of the workforce, we can also become a giver and an investor. We don’t have to choose. The goal of PwedePadala.com is to show you how to do both. You can can achieve your financial goal in Canada (or wherever you are) and in the Philippines. As an OFW, we have a chance to give more. Madalas din nauutangan. The good news is we can extend help to others and not just relatives while working overseas. More posts on how to care and share through financial support. My bottled-water alkansya thought me how to save and it still works along with different ways on how to save for travelling or buying a house. From saving coins to finding online deals, I’ll share tips and would love to also learn from you. More posts on how you can save with just about anything. You don’t need a background in finance to learn how to start investing. My first foray in finance (if you can call it that way) is reading the stock quote on a newspaper for my dad at a young age. So don’t be intimidated to start investing. Educate yourself through blogs (including my blog, talking about self promotion) and shows. More posts to guide you on how to invest wherever you are. Personal finance is a topic that I don’t get tired of talking about. But there are also other things that I would like to share to you that may still be slightly related to finance yet definitely NOT boring. Capture memories in photography. You don’t need fancy camera. The photos I use in the blog are taken with iPhone. Peek into my personal life, thoughts, and misadventures. I’m only human. I make bad ice cream choices and call it cheat day/s. If you are looking for more interesting topics, I have a complete list of category for you to dive in. Or you can send me a message. Give feedback (good or bad). I’ll take it, although I pretend to emotionally handle it well. Kaya hinay hinay sa mga komento. From here you can go back to the homepage to see the latest post. And also I would love to keep in touch and make sure you don’t miss anything on Pwede Padala. See you on Facebook or let me know whatever you have in mind.